Co-founder Paul Zeir has compiled compelling evidence linking music education to enhanced brain development in children. This research only confirms his years of hands-on experience working with children through Arts Integrated Education. 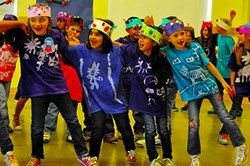 First Graders enjoying the song "Be Better"
In Arts Integrated Education children learn a subject by becoming it! Songs to Educate revolutionizes the use of music, rhythm and song with movement theater accompaniment to enhance children's learning abilities. This cutting edge methodology is being adopted by teachers passionately determined to provide arts integrated learning opportunities within their curriculum requirements. The beauty of using this method is to encourage young minds to use the Arts as tools of learning and expression. The engine of learning music, for example, is the profound human need to be able to express the inexpressible, to touch the intangible! Co-founder Paul Zeir was recently inspired to conduct his own research on existing Neuroscience studies piloted by an impressive array of universities and research institutes who have found childhood music education enhances brain development. This research was to confirm the benefits of Songs to Educate’s unique teaching methodology. Greater connectivity and flow between left and right brain hemispheres. Greater fluidity and connection between motor and sensory regions of the brain. Enhanced ability to recognize and differentiate sound and language patterns. Enhanced ability to concentrate and focus. Greater ability to process complicated patterns and sequences. Increased linguistic and mathematical intelligence. It is no surprise that music education is a boost to brain development. But music education is much more than learning to play an instrument and how to read music notation. These are an important part of the music education toolkit, largely left brain-hemisphere centered. But music education stretches beyond the technical ability to play it. Music is a language of feeling and emotion; it is a language of rhythm and pulse, of movement, pattern and sequence that explodes in our minds as vivid imagery, story and choreography. It is a language of the heart which by-passes our mental filters as a direct conduit to the human inner life! Songs to Educate helps children indirectly receive a music and creative movement education. They learn music and rhythm fundamentals as a by-product of the process. Extraordinarily children also develop skill sets such as literary, mathematics patterns and sequence, emotional intelligence, empathy, visual and sculptural arts and spatial intelligence through choreography. Songs to Educate’s methods also provide enhanced learning habits useful throughout life. Arts Integrated Learning puts the fun in fundamental! Children light up with learning when integrating the arts- especially the visual, auditory, kinesthetic and spatial modalities activated by music and movement representation of specific concepts. It brings subjects like the water cycle, the cardio-vascular system or learning the calendar out of the textbooks and into life. In Arts Integrated Education children learn a subject by becoming it. Songs to Educate is also passionate about the content and meaning of the songs themselves. These songs are chock full of prompters and primers, quests and questions, and a playful, fun new way to approach a wide range of subjects. Songs to Educate has worked with over three thousand children in various school settings since 1997. Learning to do specific rhythm patterns, coordinated percussion, choreographed movement and group singing is very accessible to human beings from an early age. Humans are hard-wired for it. There are so many benefits to Songs to Educate’s Arts Integrated approach to education. Teachers can easily incorporate this unique method in their own classrooms. Even 5 to 10 minutes a day adds to the quality of learning and provides a fun, enriched experience. For more information about Songs to Educate and Arts Integrated Education, visit http://www.SongsToEducate.com.